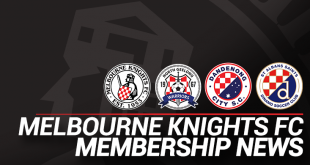 The Knights are back on the road in Round Nine, this time making the not-so-far trip away to CB Smith Reserve – the home of Pascoe Vale FC. 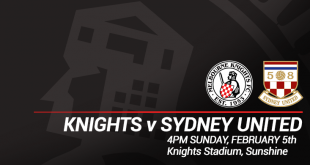 After a disappointing loss at the hands of Knights’ biggest rivals – South Melbourne FC – the Knights have had to regroup and refocus after sustaining back to back losses. After eight rounds of football played, the Knights have won a total of five games and lost three. Lucky for the side, last week’s loss to South didn’t propel them too much further down the standings, moving down one spot to fourth position as Heidelberg moved into the top three after their win against Kingston City FC. On 15 points, the Knights need to be weary of Green Gully SC and Altona Magic SC, both of whom are sitting on 13 points and within striking distance of the Knights on the ladder. This week sees the reintroduction of Tomislav Uskok into the side, after serving out a one match ban imposed after Round Seven against Avondale FC. The reintroduction of the lofty midfielder should go leaps and bounds in giving some structure to the midfield, something that was evidently absent during the match against South. After making his first starting 11 appearance since signing for the club, Daniel Visevic will be out of contention against Pascoe Vale after sustaining a groin strain during the match. 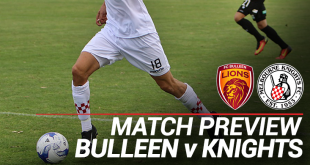 With the starting 11 resembling the side that was able to crush Bentleigh at home, the task is up to the Knights to regain their winning form against the lower placed Pascoe Vale. Pascoe Vale on the other hand, have only managed to secure wins this season against sides lower placed than themselves, Dandenong City, South Melbourne and Kingston City. Their win/draw/loss ratio currently stands at 3/1/4 and they sit on the ladder at ninth place with 10 points. They come into round nine off the back of a thumping loss to Green Gully away, going down 4-0. As always with Pascoe Vale, Knights should play particular attention to key striker Davey Van’T Schip, who sits third on the leading goal scorer tally, with seven goals to his name and a hat trick against Kingston City back in round seven. Despite their current record, Pascoe Vale always remain a threat and vigilance, especially towards Van’T Schip can’t be stressed enough.